Wondered how you can quickly start your own IMS platform? Thanks to Franz Edler, from University of Applied Sciences, Vienna, Austria, a set of configuration files as well as a WMware Debian image were made available for those that want to start building an IMS platform using Kamailio. Read this documentation written by Franz (original version in pdf format can be downloaded from here)! Here is a stripped-down version of Kamailio-IMS system – it means that the IMS functions have been reduced to the core functions, all advanced functions like NAT, RTP-relay, antiflood, capturing, dispatching etc… have been omitted (disabled). It is a good starting point for educational purposes. All three servers (P-CSCF, I-CSCF and S-CSCF) and the HSS (from original Fraunhofer OpenIMScore) are running on one machine. 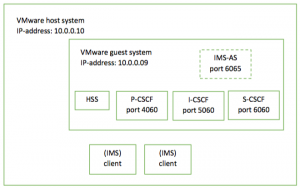 The clients are typically provided by the host system. The additional functions which are included in the existing config-files are disabled in a first step and may be added (enabled) gradually. 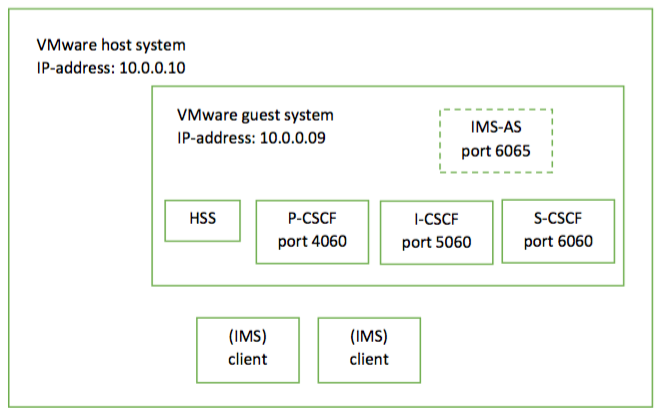 Also an application server (IMS-AS) may be easily added as a further Kamailio instance. This is perfect for educational purpose, if you want to become an IMS expert. The benefit is that all these servers and function are running on one physical machine. There is a VMware image available for this configuration and also the log-file and all relevant config-files in a separate zip-file. Now you can start immediately with the VMware image or – as I always suggest – do it yourself (compile and configure) by following the steps documented in the log-file. All parameters and passwords used are documented in the log-file. If anything is missing or if you have hints for correction or improvement, just let me know via the sr-users@lists.sip-router.org mailing list. NR: the version above was slightly edited for web and few more explicit details. Read previous articles about Kamailio and IMS! If you build some specific systems using Kamailio and want to share the details with the community, do not hesitate to contact us, we will be more than happy to post an article about it on Kamailio web site! Thanks for flying Kamailio and looking forward to meeting many of you at Kamailio World 2016!